As a business owner and/or operator in Jersey City, you need to make sure that all safety protocol and security measures are being upheld to the highest standard. If you’ve been in business for a number of years, and you’re just now getting to your business’s security, it’s time you completed a physical security assessment. What does a physical security assessment involve? 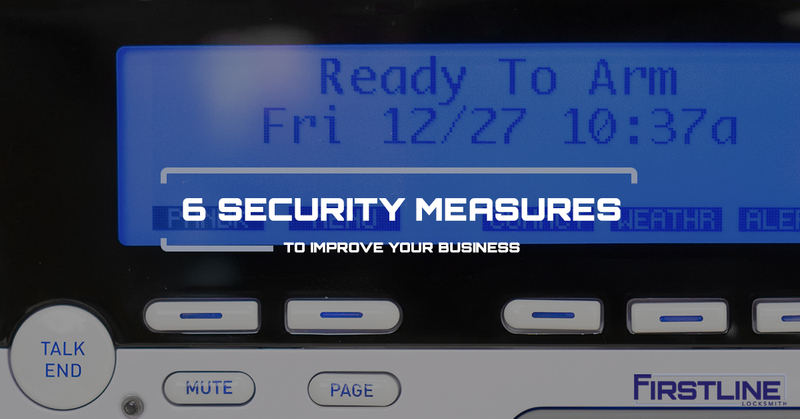 In this post, Firstline Locksmith shares the six measures to assess to improve your business security. Why Conduct A Physical Security Assessment? In most cases, a physical security assessment is used to show potential buyers or leasers how well the building is protected. However, you’re already using the building, and you want to secure it from potential threats, external and internal. The primary reason to conduct a physical security assessment of your building is to measure how well it will stand up to security threats. For example, if you have any external doors that do not have locks or access control installed, your building, assets, and colleagues are at risk to criminals. The same goes for internal security measures. Specific portions of your building like server rooms or vaults need to be more heavily secured than others. Without the proper commercial security measures, you are at risk. One of the quickest ways to better secure your business is to upgrade the doors, external and internal. Hollow interior doors do not stand up well to potential break-ins. Your exterior doors need to be more than hollow steel doors. Install solid wood or stronger on the interior of your building and solid steel for the exterior to maximize breakthrough resistance. If you’re on the second or third floor with no access to your windows from the exterior, you can disregard this security measure. However, for those businesses that do have a first floor with windows, you need to consider the type of window and the strength of the latch installed. Burglar-proof glass along with heavy-duty window latches are a great way to secure windows. Door lock upgrades go hand-in-hand with door upgrades. If you’re installing doors to improve office security, you may as well get the commercial door locks, too. You will want to go with the door lock that fits your needs. Instead of installing the most expensive door lock you can find, consider how secure of a lock you actually need. For offices a moderate-duty lock will most likely work. However, for a bank, a heavy-duty lock is what’s necessary. In most cases, banks need vaults, which are the toughest locks to break for criminals. Remember, your door locks are only as strong as the doors you install them into. Do you already use security cameras? It may be time to install them. Granted, commercial door locks, upgraded doors, and burglar-proof windows may increase your building security, they are not fail-proof. You’re simply trying to make it as hard as possible for a criminal to break in. And if they stick around long enough to succeed, you want to get them on camera doing it. You can then share the video with the proper authorities. A great way to deter criminals after they attempt to break into your business is to utilize an alarm system. A loud, blaring alarm will send most criminals running. In some cases, a silent alarm is more effective, because the type of equipment or items the criminal looks to steal take a while to remove from the building, which means the longer they’re in the act of committing a crime, the longer the proper authorities have to catch them. Also, silent alarms are used in banks and other institutions that have a high chance of customer or employee risk during a burglary. Add an alarm to your business and increase the level of security to protect your building, assets, and employees. Finally, access control is an upgrade to your business security that will work to manage the flow of people in and out of your building. It can also be used to implement access cards, which work differently than physical keys. However, you can utilize both. Commercial security operations that use access control have a better idea of who entered, who exited, and who potentially committed the crime. Assessed the physical security measures in your business? Give Firstline Locksmith a call today to take care of your commercial locksmith services.